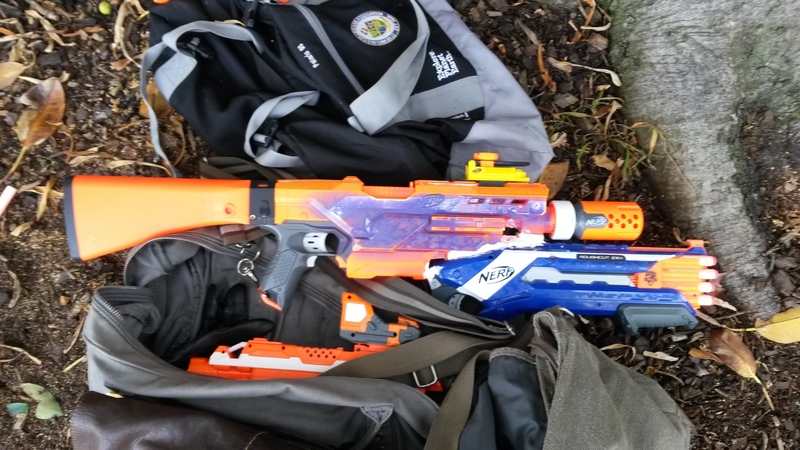 I hadn’t attended a full Nerf event in months before this month’s HvZ, so I was really excited to get back into action. 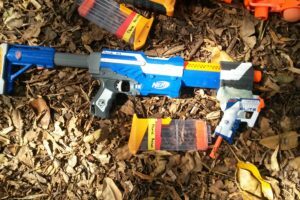 As usual, this Nerf Game Report will describe the blasters that saw use, the gamemodes we played, and in particular how the Husk made an impact in games. 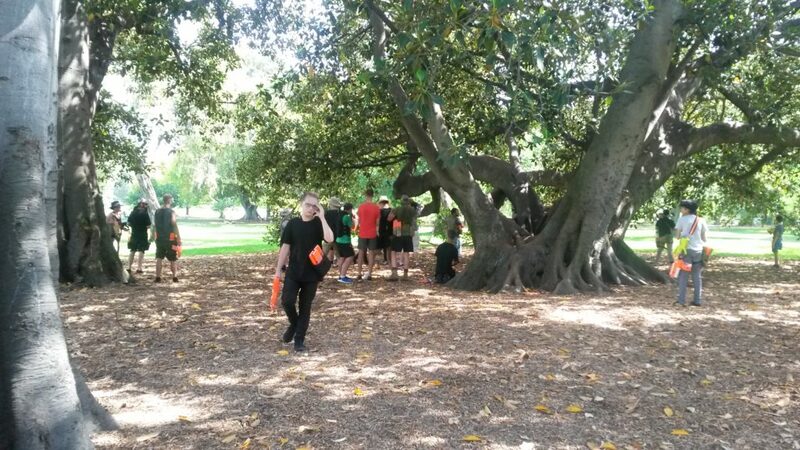 (Regular) Survival – Standard HvZ gametype, humans try to survive for a given amount of time (or until the last human falls). Zombies are given access to upgrades at various times, we used Infectors at 5 minutes, Tanks at 10 minutes and Husk at 15 minutes. Last human to fall wins. Secret VIP – There are 3 special players in this game: the VIP, the General and the Traitor. The VIP is a human who the other humans are trying to protect and is restricted to a given area (we used the usual tambark area), while the Traitor is a zombie masquerading as a human. When stunned, zombies must move outside of the VIP’s area before counting down their stun. The only person who knows the VIP’s identity is the General, while all original zombies know the Traitor’s identity. Everyone knows the identity of the General, making them the only guaranteed trustworthy human. 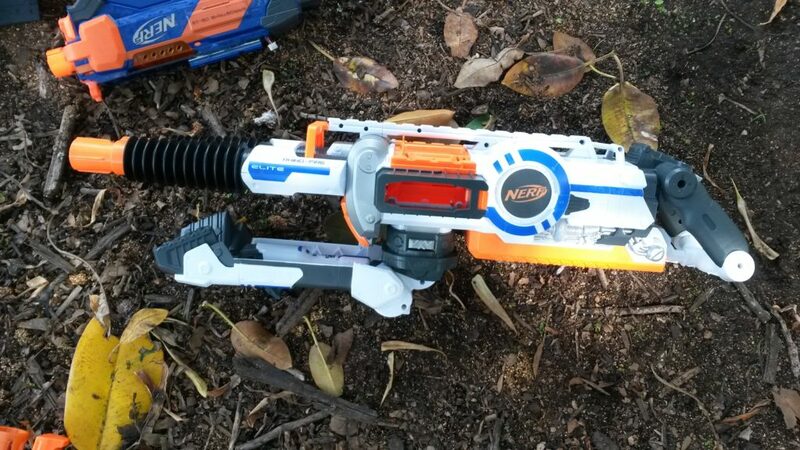 The Traitor acts as a human, but can at any point do a single Traitor zombie tag, revealing that they are the Traitor, and thus turning into a regular zombie. Additionally, if a human hits another human, the hit human is stunned as if they were a zombie, however they can still fire their blaster. If the humans protect the VIP for a given period of time (e.g. 15 minutes), the humans win. If the zombies successfully tag the VIP, the zombies win. Zombie upgrades are unlocked on a timer like Survival, with Infectors available from the start, 5 minutes for Tanks and 10 minutes for Husk. If a human is hit by a grenade, they are instantly turned into a zombie. This is the only way to actively eliminate the Traitor. Defence Survival – The three zombie upgrades of Infector, Tank and Husk are spread throughout three separated squares, about 2-3m wide. Zombies can pick up the upgrades if they touch the desired upgrade inside the squares. If a zombie is stunned within a square, they must move outside of the square before counting down their stun. 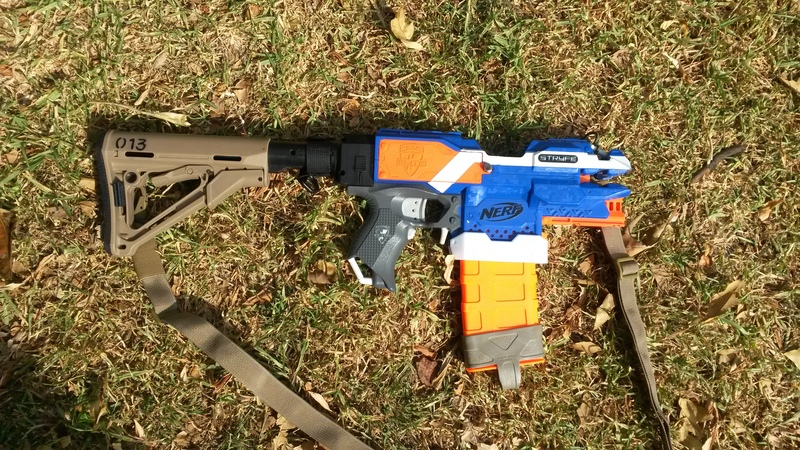 Zombies are only allowed one upgrade at a time. 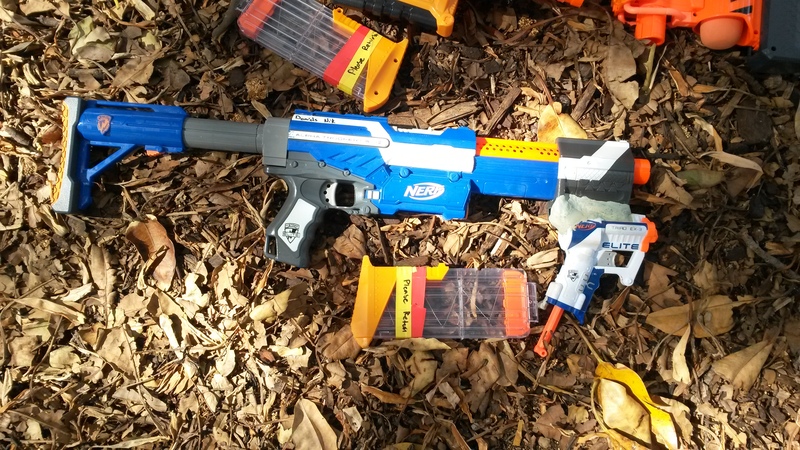 6 Round Sweep – Each human starts with only 6 darts, and must pick up ammo from the field. Ammo can also be returned to the ammo crate, with an admin recording each player’s deposited ammo count. 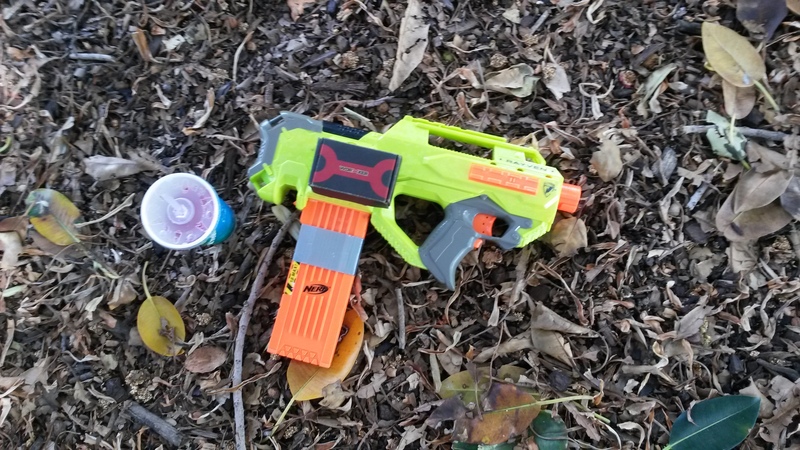 The player with the highest ammo count deposited at the end of the game wins. 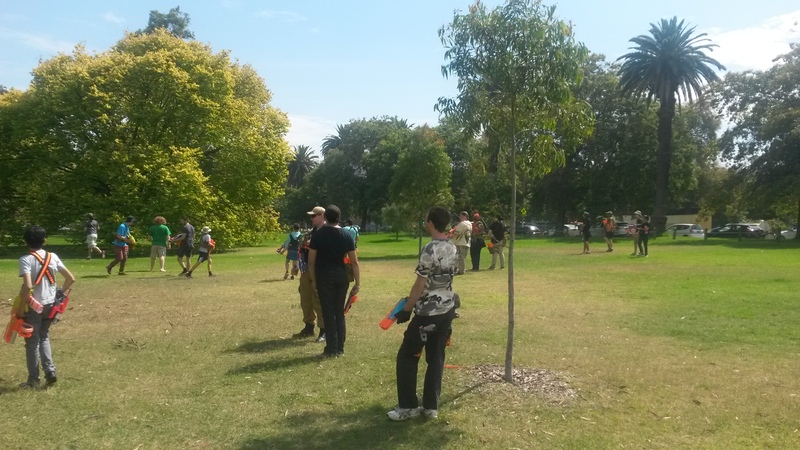 When hit by a dart, humans must touch a tree to respawn. 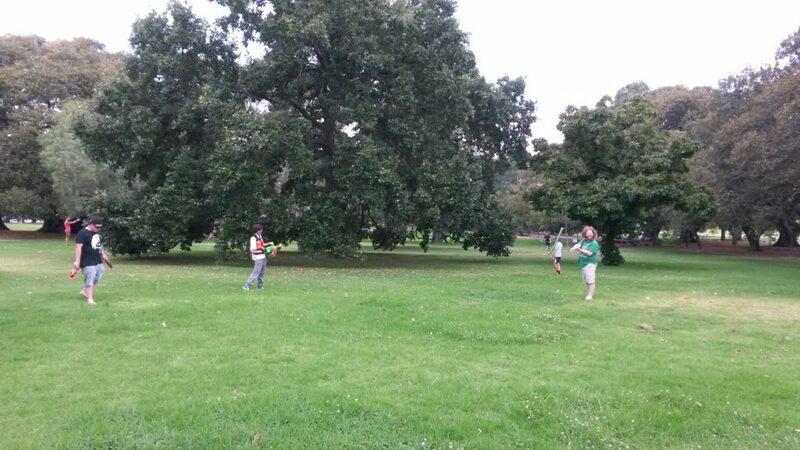 While moving to respawn, humans are invulnerable to darts, but are still vulnerable to zombies. 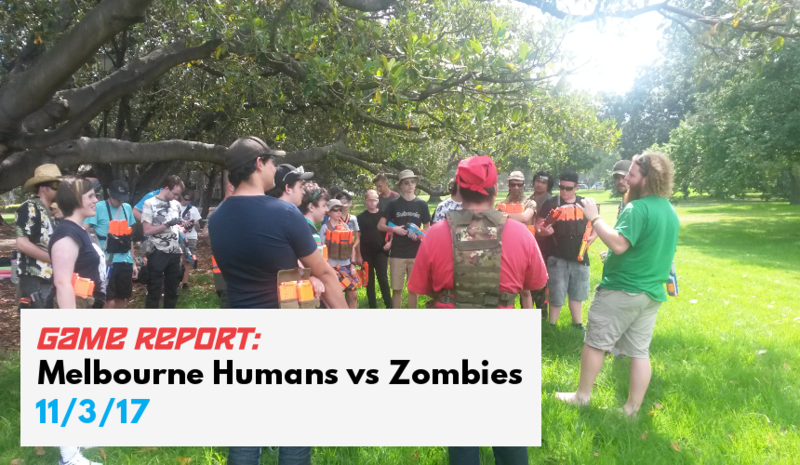 When a human is out of respawns, they become a zombie. Zombies can pick up darts off the field and return them, but this does not count to their ammo count score. A zombie tag or melee hit immediately turns a human into a zombie, regardless of number of respawns left. The game ends when all players are zombies. 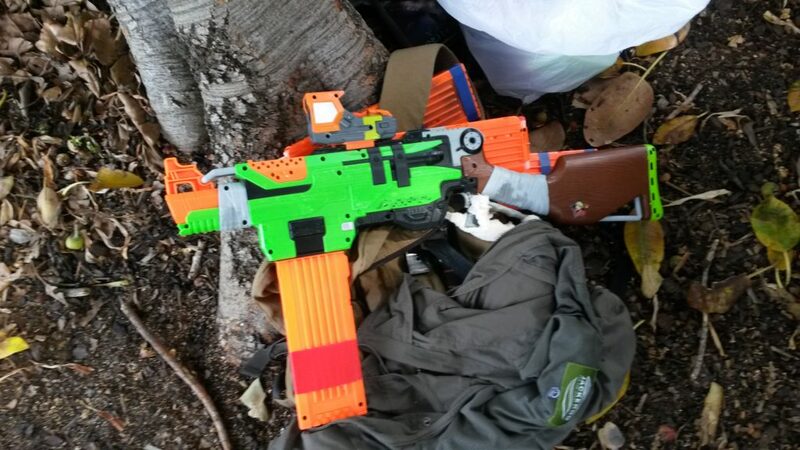 Zombies tag humans with their hands onto any body part, blaster, tactical gear, etc, turning the human into a zombie. If a human hits a zombie with a dart, the zombie is stunned for a count of 20. A human can also stun a zombie with melee, but only with a direct hit to the back. 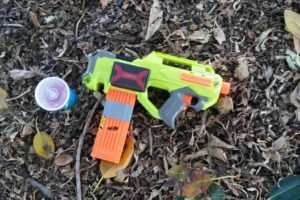 Husk – a zombie gets to use a ranged attack, in this case a Vortex Mega Howler. A ranged Husk attack counts as a regular zombie tag. Husk ammo can be picked up by any zombie, but can only be used by the Husk naturally. 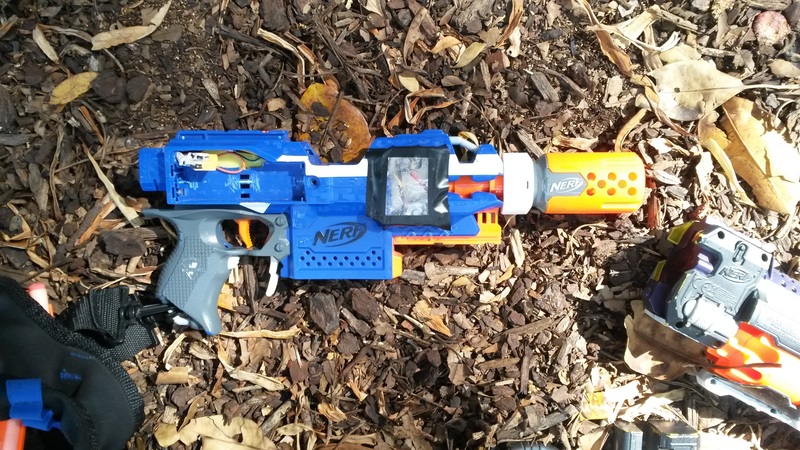 The Husk may move from the place they were stunned to retrieve their ammo, but do not count down their stun timer until they return to their original stun place. Zombie upgrades cannot be stacked, so a zombie can only have one upgrade at any time. If in play, grenades can stun a zombie with a hit to any equipment, including swords and shields, and can be reused at will. If human vs human rules are in effect, a grenade hit to a human will turn that human into a zombie immediately. 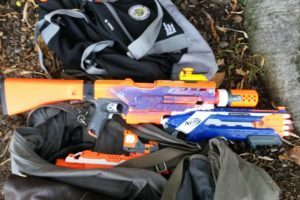 Since there were a lot of different blasters there, I’ve generalised them and only listed down the ones that I saw as significant or noteworthy, or remember for that matter. 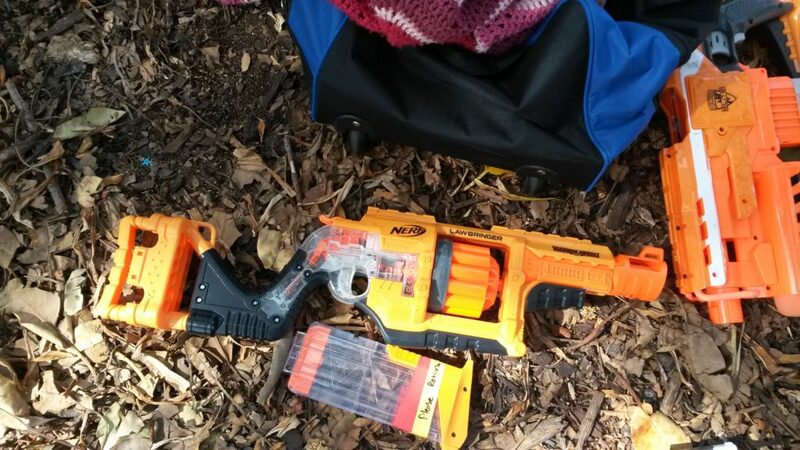 Being that I can’t be everywhere at once, it’s entirely possible I completely missed some blasters. 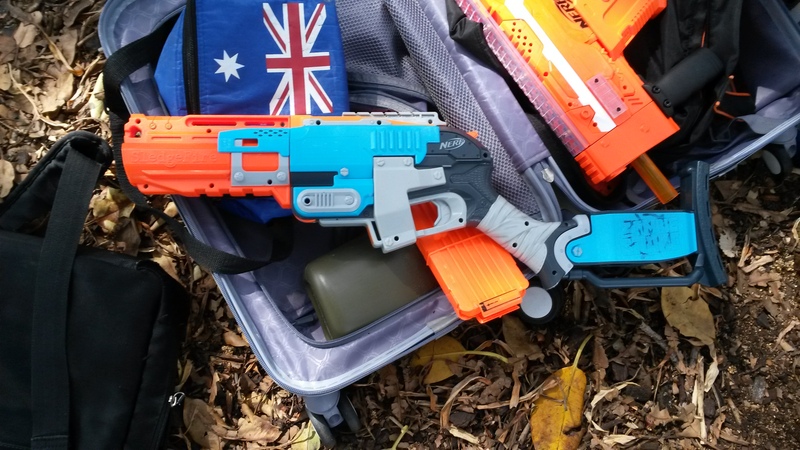 Elite Rapidstrike (various motors, LiPos) – standard high ROF blaster at HvZ, ideal against larger groups of zombies and close quarters combat. 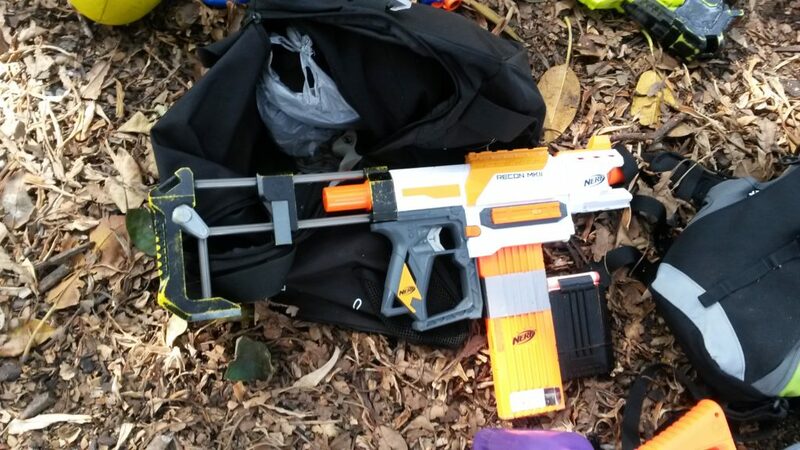 Requires a lot of trigger discipline and ammo to keep in check. 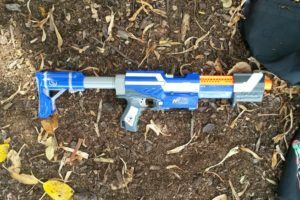 I’ve included a particular Rayven in this category as it has an automated pusher, turning into a full-auto blaster and making it perform very similarly to a Rapidstrike. 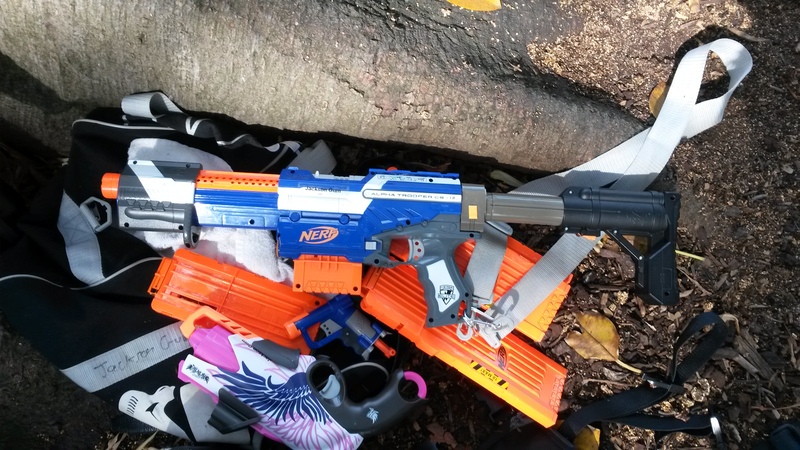 I also trialled a short brass dart guide in my Bullpup RS, just a shortened version of my existing brass guide. 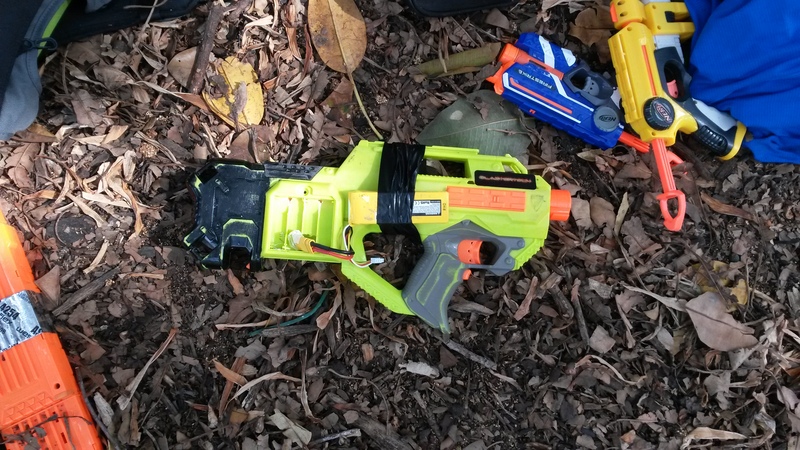 It performed very well, with minimal, if any, muzzle velocity loss while also greatly improving feeding reliability. 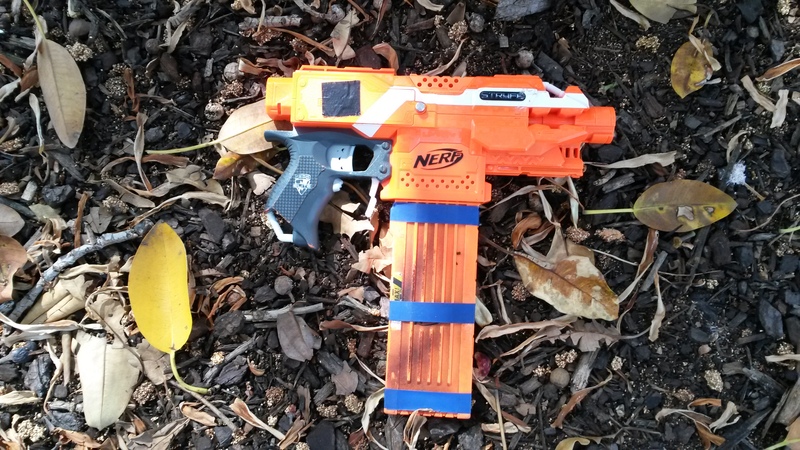 ZS Slingfire (upgrade spring) – regular blaster used by one particular player. He utilises its one-handability well, and generally has a lot of fun with it. 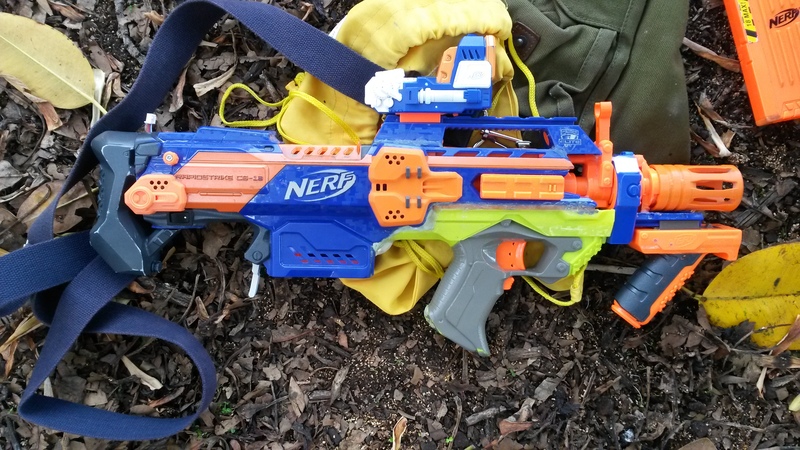 Not a particularly practical blaster, due to having significantly inferior ROF to more powerful blasters such as a pump-gripped Retaliator, but a stylish and fun blaster nonetheless. 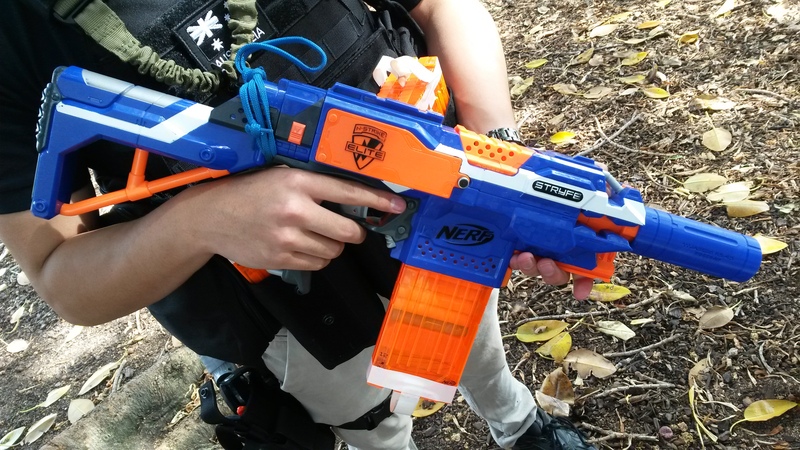 Elite Stryfe (various motors, LiPos) – standard all-round blaster at HvZ, effective in most situations. 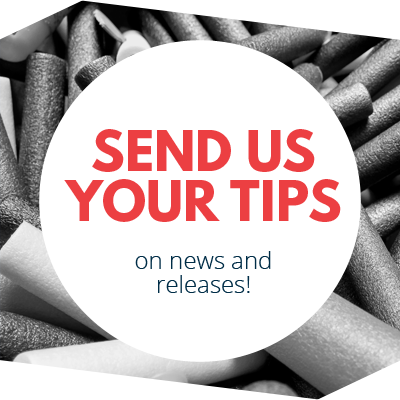 Very easy to pick up and use effectively, even with a bare minimum of practice. 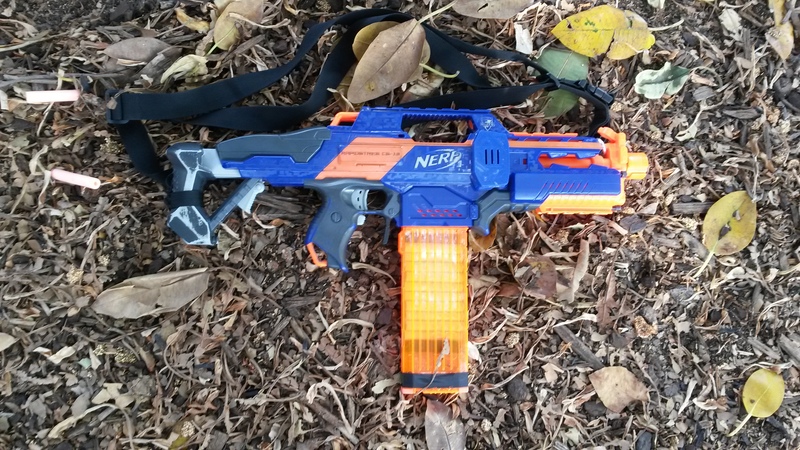 N-Strike Rayven (various motors, LiPos) – a well built Rayven performs essentially like a Stryfe, a solid all-round blaster that can hold its own. 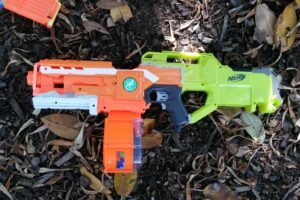 There are several issues with the Rayven that hinder its performance and must be fixed that do not occur with the Stryfe, which is a significant contributor to why Rayvens are less common than Stryfes. 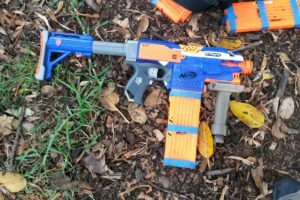 Elite Alpha Trooper (various upgrade springs) – an easy-to-build pump action springer that works decently well, however in many respects is inferior to a number of other blasters. 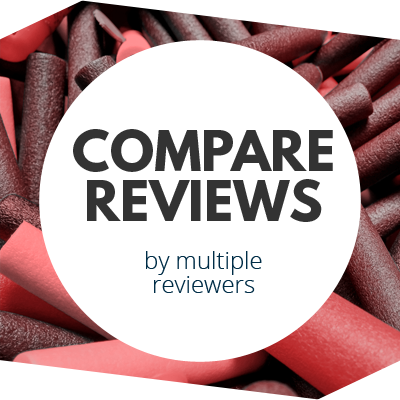 In particular, a pump-gripped Retal, while much more expensive, is also a lot more powerful, robust and customisable, and top notch flywheelers tend to have much higher ROF and superior range. 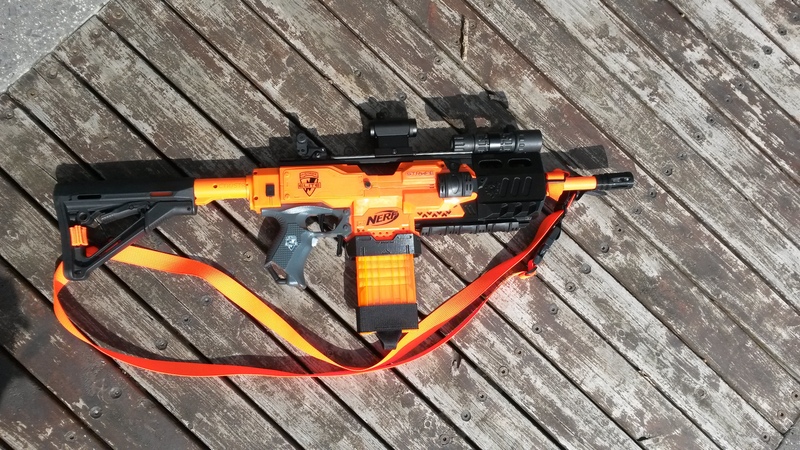 ZS Sledgefire (singled, upgrade springs) – a fun, if slightly impractical choice for HvZ. Capable of quite accurate mid-long range fire support if built correctly, however suffers majorly against multiple targets or in close range due to being a single shot. 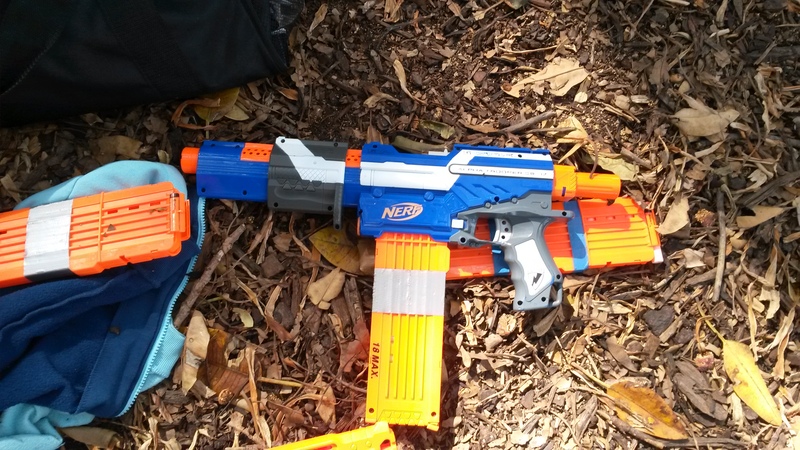 Modulus Recon MkII (unknown mods, if any) – Recon MkIIs and Retaliators are typically very common at HvZ, usually equipped with pump grips, but this was the only one I saw on the day. 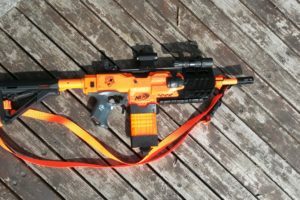 With an upgrade spring and a decent pump grip, they offer usable ROF with quite good power, as well as a lot of customisability. 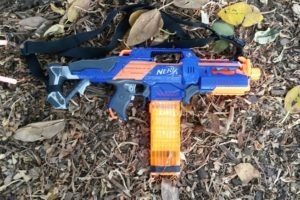 Without a pump grip, they are quite compact, making them easy to maneuver. 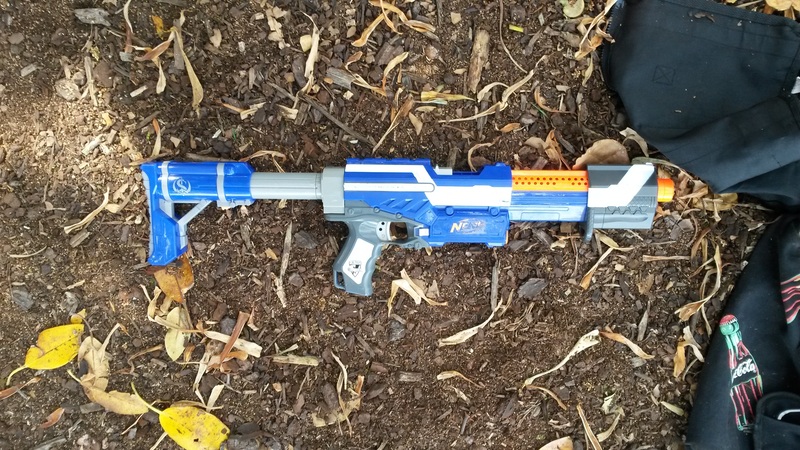 Doomlands Lawbringer (unknown mods, if any) – essentially a high capacity, rifle sized Hammershot. 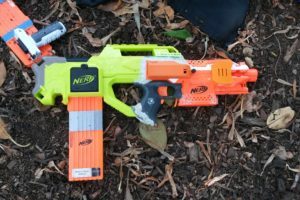 Usable power, good capacity and one-handability make it a decent scavenger blaster, however its relatively low ROF and slow reload leave it at a significant disadvantage as the horde grows larger. 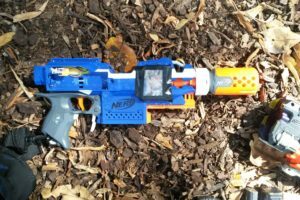 Dart Zone Enforcer (overvolted) – an odd but fun and novel blaster. 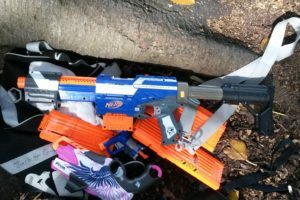 Its use of flywheels allows for decent performance, and the large looped belt offers a decent capacity that is also easily reloaded on the fly. 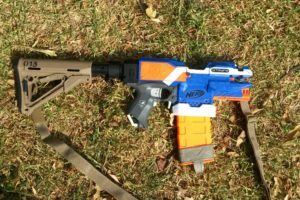 It has a low ROF for a full auto however, and the lack of spare belts makes quick-reloading a non-possibility. 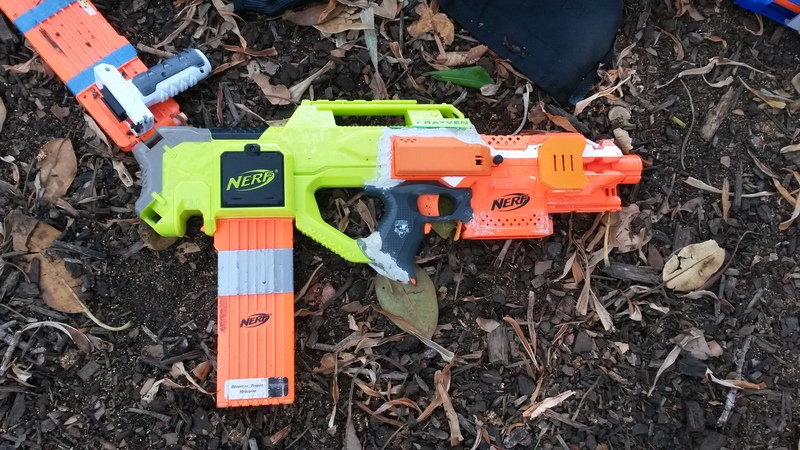 Elite Demolisher (unknown mods, various extras) – a Demolisher would perform very similarly to a similar spec Stryfe, being a solid all-round blaster when built well. 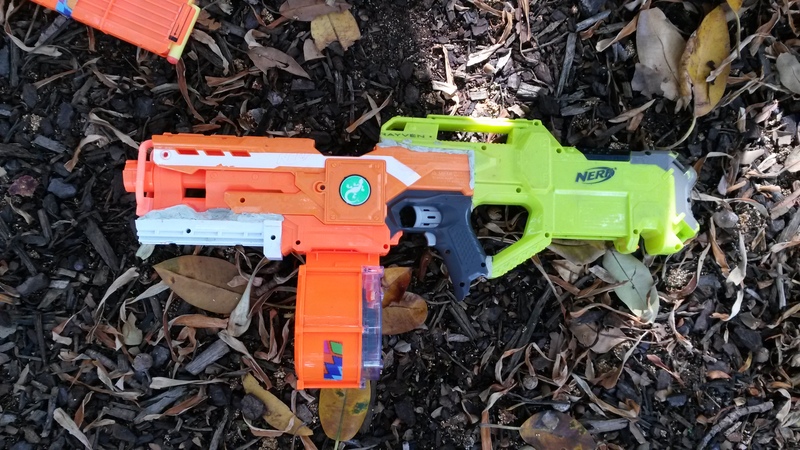 One Demolisher had an underbarrel Roughcut, which provides a nice extra burst of darts at the cost of significantly increased forward weight and bulk. 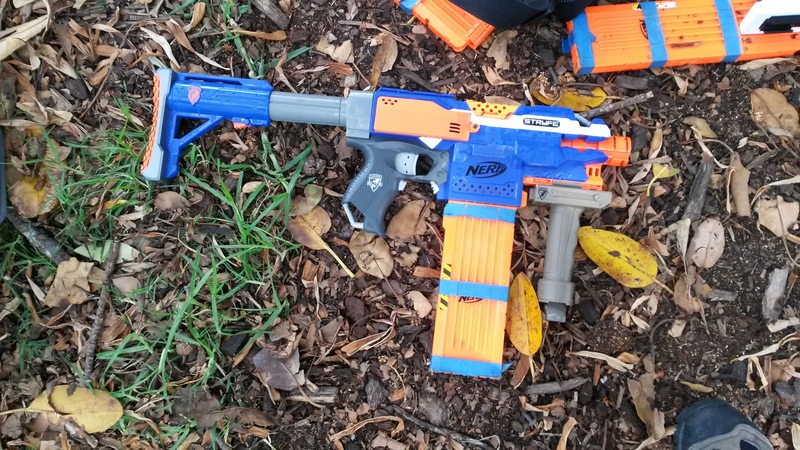 Elite Rhino-Fire (rewired, Honey Badger pusher) – an absolutely ridiculous but extremely fun blaster. 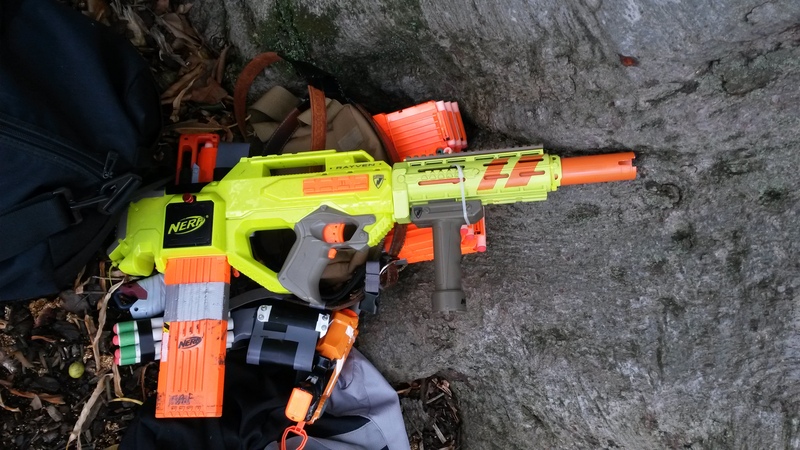 Its range and accuracy are quite terrible, well below that of a good Stryfe/etc build, and its ROF is not exceptional compared to builds such as a Honey Badger pusher’d RS. 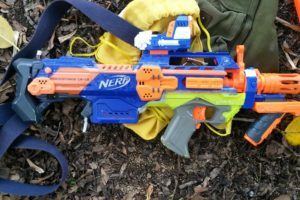 That said, the dual reciprocating barrels spewing out a cloud of foam is quite a sight to behold, and incredible fun to be wielding. 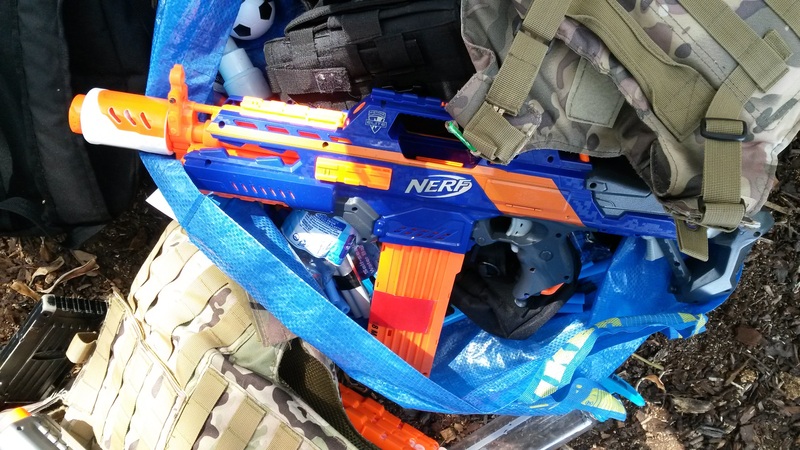 This will probably be the last time I bring the Rhino-Fire to an event for a while. 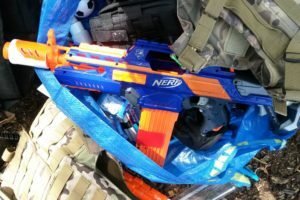 Though it is a lot of fun, it is also very inconvenient to transport and set up. 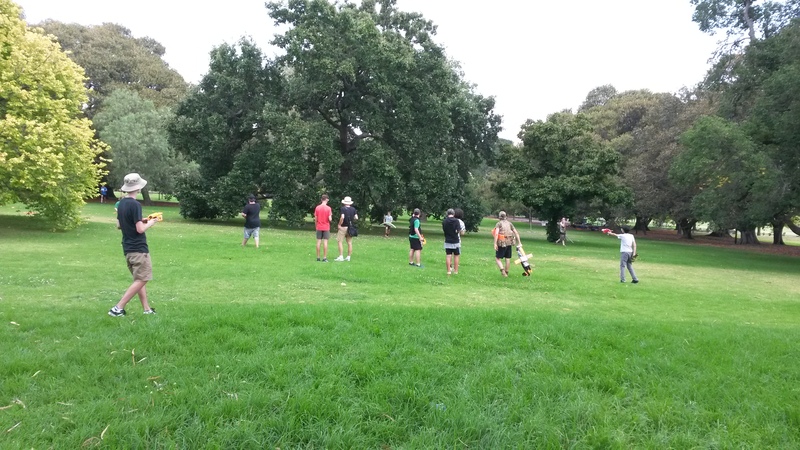 Same play area as always, a large triangle filled primarily with grass, with a couple of notably large trees. 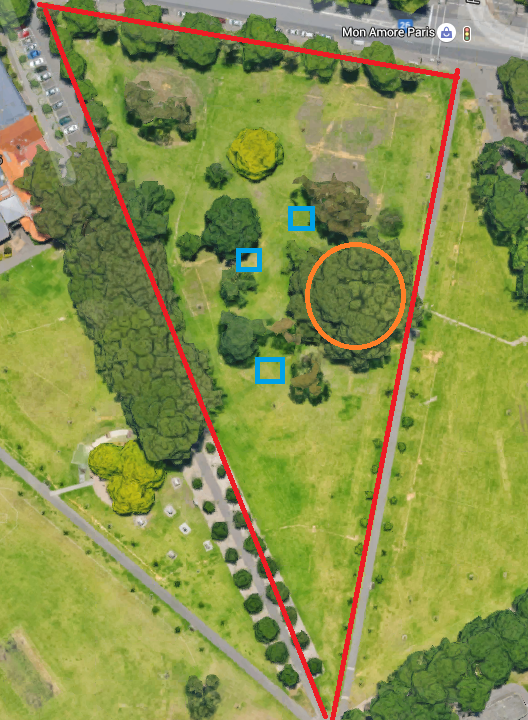 One particularly large group of trees is also covered in tambark, circled in orange. Weather was very nice on the day, temperature peaking around 26C with some sun and some cloud cover. Player count was also quite high, peaking around 35. As usual, we started off with a regular Survival round. Nothing significant occured until the zombies gained access to Tank shields, and even then it took a little while to start getting the tags. 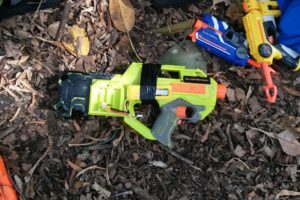 The Husk was later able to provide a further threat and distraction, however generally speaking it was either Tanks or poor situational awareness that got humans tagged. Eventually the horde would reach a size where tactics were no longer really necessary and they would be able to continually whittle down the remaining humans through sheer attrition and numerical superiority. We switched to Secret VIP for a couple of rounds. Generally speaking, the humans performed much better in this event than in past Secret VIP rounds. Somehow I have no recollection of the first round we played, so I can only describe the second and third rounds. In the second Secret VIP round, the humans were very well coordinated and stood up well even in the face of repeated Tank charges. The Traitor revealed themselves late in the game, however as always I wasn’t near them when that happened, and they seemingly just used their Traitor tag on the General. While human numbers did begin to dwindle in the dying minutes of the round, there were still more than enough to provide quite a substantial volume of fire. The VIP, along with at least 10 remaining humans, survived the entire 15 minutes for a human victory. In the third Secret VIP round, after the lunch break, the humans again performed very well. I was selected as the VIP this round. Through the first 12 or so minutes, the humans held firm against Tank charges, though the Husk made his presence known and feared, and was able to achieve a couple of ranged tags, as well as providing quite a good distraction. Late in the game, the Traitor revealed themselves and tagged the General, who then conveyed my identity to the Husk. As it happened, the Husk was the one who tagged me from range, while I was busy dealing with other zombie threats, ending the round with a zombie victory. In a lot of Secret VIP rounds, a big deciding factor is the Traitor. The Traitor is in the best position to throw the human group into chaos, who through sheer volume of fire otherwise have quite a good chance of survival. The Traitor’s influence on the game is clearly obvious when looking at the history of Secret VIP rounds. In rounds where the Traitor has attacked the humans from within, the zombies almost always win. Even if the Traitor’s attack is quickly stopped, the ensuing confusion and chaos will often allow the zombies to get a number of tags on the distracted humans. Even if the VIP remains untagged through this ordeal, the sudden loss of human numbers is usually enough to swing the round in the zombies’ favour. In rounds where the Traitor instead chooses to simply tag a human (usually the General) and be done with it, the humans have a much better chance of survival. Ignoring unlikely scenarios such as the Traitor randomly tagging the VIP, this play generally has a much smaller impact on the human group and often causes them to coordinate better. 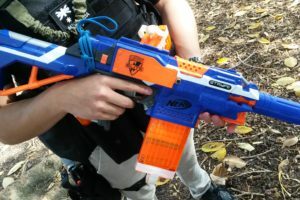 Although the zombies learn who to focus their attacks on if the General is tagged, the humans now can also know who to focus their defence on, without the threat of the Traitor from within. The Husk continued to show their power and threat in Secret VIP this event, with several tags including one on myself as the VIP. The confined area of Secret VIP makes it an ideal hunting ground for the Husk, as they can consistently bombard the human group from relatively close range, whether just going for tags or targeting a specific player. In Survival games, the threat of the Husk can be mitigated by simply moving away, as a long range Husk throw is generally much easier to spot and dodge. Additionally, the Husk on their own is rarely a threat as it is easy enough to dodge their throw and stun them. In Secret VIP, the constant danger of surrounding zombies draws a lot of attention away from the Husk, giving them a much better opportunity to score some tags on humans. It was exactly this that left me as the VIP vulnerable to the Husk. Distracted by other zombie threats, I’d left myself open to a mid range throw from the Husk, who nailed the throw perfectly, hitting me square in the back. We then played a round of Defence Survival. 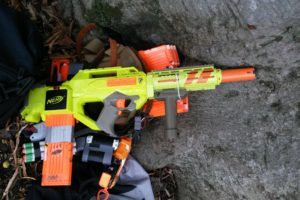 In this round I set up the Rhino-Fire near the Tank square, and had a lot of fun hosing down any zombies who got too close. 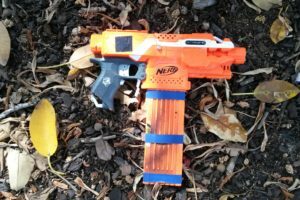 The slow rev time of the Rhino-Fire quickly became a problem however, so I ditched it in favour of using my Rapidpistol. 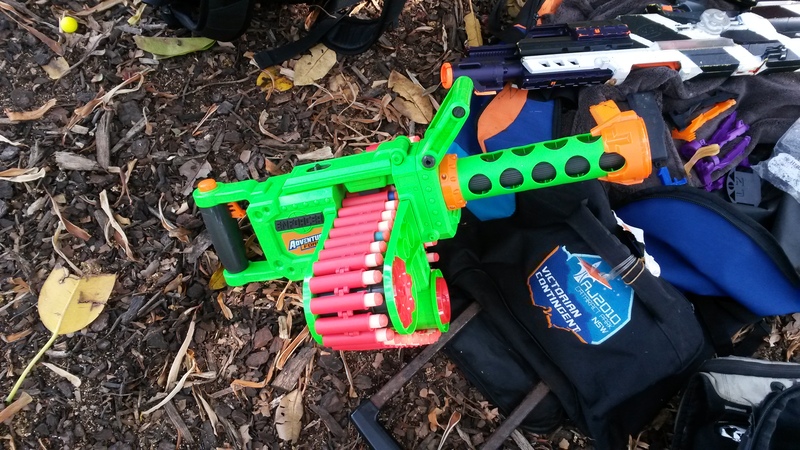 I let other humans use the Rhino-Fire, and they had an absolute blast with it. All three squares were lost quite quickly, forcing the humans to leave their defensive positions, and the game quickly devolved into a regular Survival. 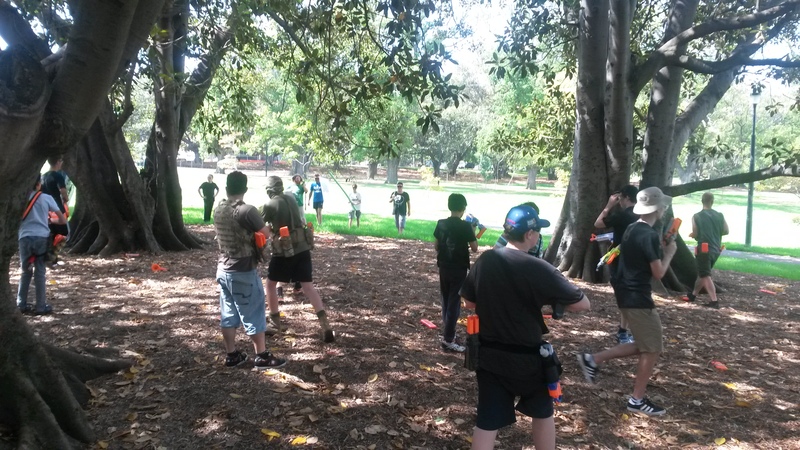 After losing defensive positions, I linked up with another group of humans, and we stayed along the north edge of the play area. Through group coordination, we were able to fend off a number zombie attacks including multiple Tanks for quite a while. As our numbers dwindled and zombie numbers grew, our defence became less and less solid, until one fateful Tank charge would break our cohesion. In the mayhem, we lost multiple humans and the remaining survivors quickly scattered. As one of the last few survivors, I was able to stun a number of zombies before being eventually tagged by the Husk. We ended with a round of 6 Round Sweep. This game is usually played just before the lunch break to partially recover darts used in the first half of the day. 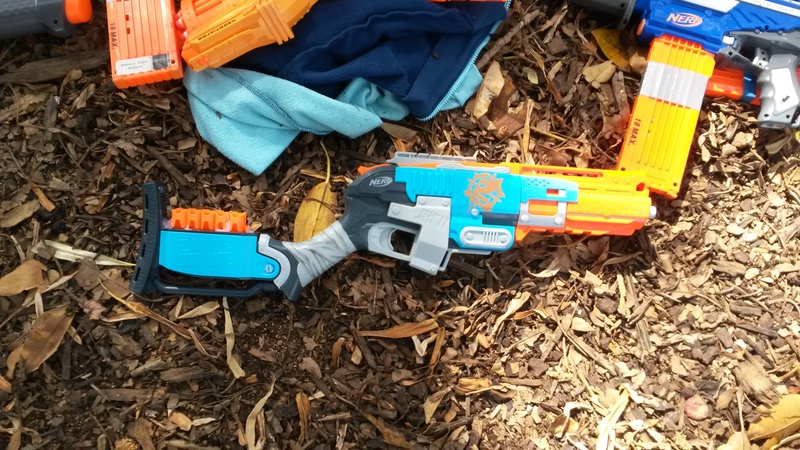 This event however, it was instead used as an end-of-event dart recovery. In typical 6 Round Sweeps, there is a fair bit of competitiveness as players typically still have a fair amount of energy, and this fuels the competitivity and combat of the game. At the end of an event however, a lot of players are rather tired, and so there was generally a lot less combat and a lot more of just dart pickup. 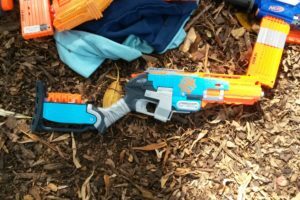 Furthermore, as a combat pickup game, 6 Round Sweep is still much less reliable at cleaning up the play area than a proper dedicated dart sweep. 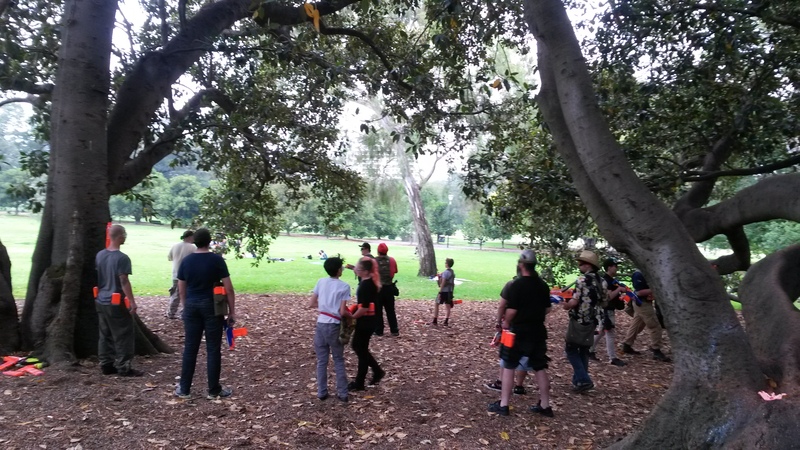 Although this time around we collected the majority of darts from the field during the round, this can be attributed partly to the game being played at the end of the event, and players simply wanting to avoid another dart sweep. On the other hand, 6 Round Sweep does offer players some freedom at the end of the event. There are some players who, while picking up darts, would still like to shoot at or chase down other players. Conversely, there are players who would be happy just to pick up and return as many darts as possible. An end-of-event 6 Round Sweep allows for both types of players, as it rewards both those who actively pick up and return darts, and those who defeat other players. 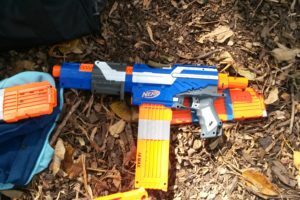 The combat element does of course increase the necessary dart pickup, however the volume of players actively picking up darts usually mitigates this. 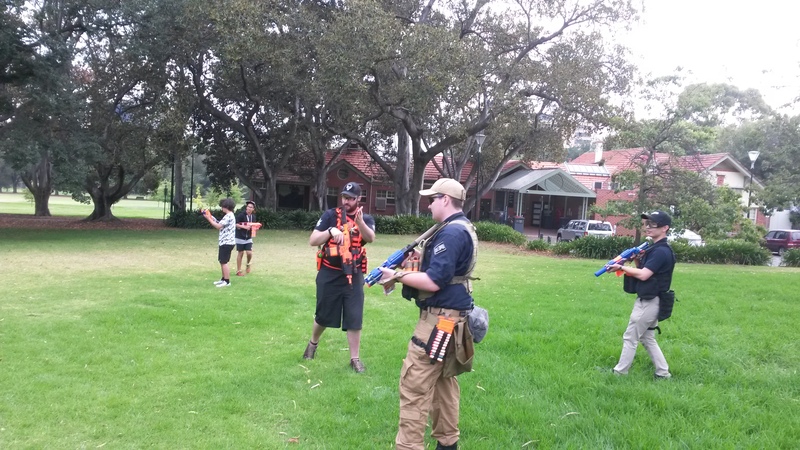 I had a lot of fun at this HvZ event. 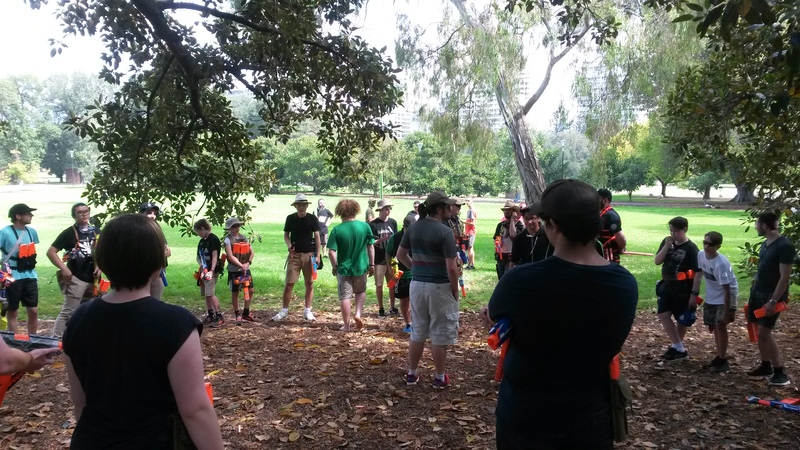 The player count in the past two HvZ’s I’ve attended have been well up compared to a lot of last year’s events, which is very exciting. I would like to see more variety in gamemodes, but I suspect I may have missed some from the February MHvZ. 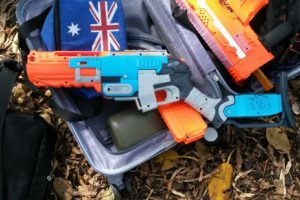 This entry was posted in Game Reports on March 14, 2017 by Outback Nerf.